Enjoy a break from the hot summer sun in colorful style with this 10 ft. x 6.5 ft. rectangular aluminum patio umbrella. Featuring a sturdy, rust-resistant aluminum frame and canopy made from UV resistant outdoor fabric. 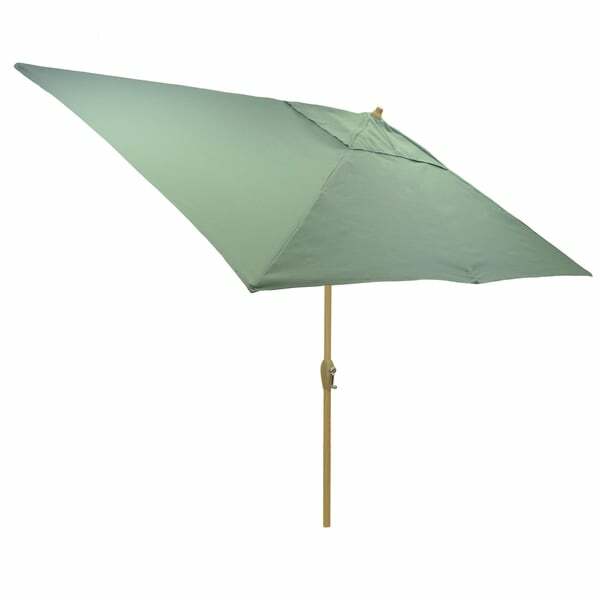 Easy to open and close with a crank mechanism, the push-button tilt allows the umbrella to be repositioned to provide shade throughout the day. Dimensions 116.14 In. X 76.77 In. X 98.43 In. The size of this rectangular umbrella was too unwieldy for the pole. I returned the item for a round umbrella. the frame is substantial and the fabric is on the thin side so it may not block the sun totally. still a good deal for my purpose. The pole offers no strength and snapped in half during a rain storm. I am very unhappy. How to Store a Patio Umbrella for Winter from Overstock.com. If patio umbrellas are stored incorrectly, mold and mildew can grow on them, leading to an unpleasant surprise the following spring. Tips on Buying a Patio Umbrella from Overstock.com. Our guides provide customers with tips on buying a patio umbrella.